Hi everyone! I hope you all had a nice Easter. Did anyone else find it impossible to come up with a menu when fully stuffed from a delicious dinner? My word I feel like I never want to look at food again, well until tomorrow anyway LOL. Dinner was so good, but the best part of all was the dessert, Strawberry Banana Trifle. Oh my! What was your favorite Easter dish? Last week on our menu was the Ultimate Grilled Cheese recipe. I loved it and was all over the Miracle Whip gooeyness of it but my husband, not so much. If anyone else tries it out I’d love to know what you think of it. Menu Plan Monday guidelines here. Yum—sounds like a tasty week! That trifle looks so good!! The cheddar ham soup looks great. My favourite Easter Dish was the campfire roast. We went camping with some camping “professionals” who cooked a roast in a camp oven dug into the ground near the fire. It was a leg of lamb with tomato soup, onions and carrots. The flavour was amazing. I am going to try and replicate it at home. Your strawberry banana trifle looked so delicious. The trifle looks great. It is one of my favorite summertime desserts. I planned my menu on Saturday because I didn’t think I would have time to do it today. I am glad I did because I can’t even think about eating anything else right now. We did the nontraditional thing and had 5 Guys hamburgers for lunch and tacos for dinner… I am stuffed! I tried the teriyaki chicken recipe you posted a couple of weeks ago. I have now served it twice! For me that is a miracle! Thanks! That trifle looks de-lish. We are making our quesadillas with black beans too. Enjoy your week! Oh wow that trifle looks SO GOOD!!! I’m stuffed from Easter dinner, too! My mother-in-law cooked, though, so I’m not tired from it at all! Life is good. I am all over the Black Bean Quesadillas – thank you so much for the link! Wow. I can’t believe how long it took me to make up my first Menu Plan Monday post, but it was worth it. I printed out the recipes as I went and now I’m all ready to go for the week! I think I’ll start a bit earlier next time though, lol. Well now I’m off to put the plan to action (it’s evening here in Australia). You have a yummy week lined up! That trifle looks deliciously amazing! For Easter, I made a pork cumin-rubbed pork roast. It was from Chris Carmichael’s Fitness Cookbook. He was Lance Armstrong’s trainer. The recipe was surprisingly easy. I mixed a rub of cumin, olive oil, and other spices, rubbed it all over the roast, and threw it in the oven for about 35 minutes. That was it! I was surprised at how moist the roast turned out as well. See my menu plan and add your sewing posts to my Mr. Linky at http://www.learningtobefrugal.wordpress.com. Once again, wonderful job on the trifle and good luck on your menu this week! I know the feeling about trying to menu plan after Easter dinner – too hard. My menu this week is light – inspired by the spring Food and Family magazine and Weight Watchers. I’ve been lurking for a while, and finally started to meal plan today. Thanks for the inspiration. Hubby ate them all day long, I was good and limited myself to a total of 3 for the day. I can’t wait to use the same dough to make cinnamon rolls! As for my menu for this week. This time I included some recipes, one is TNT (Tried and true) the other two I haven’t tried yet, but they do look good! And like you, I’m going to be using up some of the Easter ham with other recipes. But that’s what I look forward to. And later on I’ll make Split Pea Soup with the ham bone. My mom looks forward to that, since I use some of the sauce (Brown Sugar & Sherry) that we used to baste the ham with in the pea soup. It gives it a nice flavor – since the ham was cooked in it and I guess not unlike the English tradition of adding sherry to their pea soup. After making the pea soup, Everyone in my family gets some, so I always make a bunch and freeze it for those that don’t live nearby. It’s a way to care for my extended family. We went out for Easter lunch. I have to say that the Catfish was my favorite dish, at Landry’s Seafood House. You have a terrfic week! The trifle looks absolutely wonderful–I can’t wait to try it. 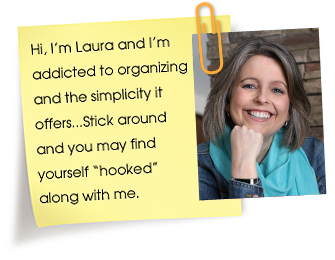 Thanks for hosting this, it helps me to get organized for my family, and I love seeing what other people are doing. We didn’t actually have any conventional Easter meals. We were visiting my side of the family and they don’t do traditional meals such as ham at Easter or turkey at Christmas. My husbands family is very traditional though. That strawberry trifle looks absolutely delicious… !! Oh that looks very yummy!! My favorite dish was a frozen peanut butter pie, an old family favorite. I made the same trifle recipe, I threw the raw vegan out the window for the day…LOL, and it was WONDERFUL!!! Everyone loved it. Thanks for sharing! Your menu looks great! My favorite easter food is the ham (or is it the potatoes, or the deviled eggs, or the fruit salad???) I really can’t decide. Your triffle looks beautiful. I make one like it but I add blueberries. So yummy! Have a great week! The Ultimate Grilled Cheese recipe sounds wonderful but I would have to use mayonnaise as the recipe calls for rather than Miracle Whip. Icky stuff, although my husband likes it. We have to keep both in our refrigerator. I like to make homemade tomato bisque soup to go with grilled cheese sandwiches. I’ll have to try this next time soup and grilled cheese are on the menu. Our favorite Easter dish was the Mee Krob appetizer we ordered at the Thai restaurant where we have our Easter dinner! the triffle looks amazing. I loved our whole Easter dinner, spiral cut ham (we just bought a few slices for the two of us), mashed yukon gold potatoes & asparagus, all followed by single serving sour cream peach pies. After following along for a while, I am officially joining in on the fun. You’re menu sounds delish! Thank you so much for doing this. Hopefully this can get me back on track and more organized. oops I think I accidentlyhit the bottom twice because I am on there twice. Could you please fix it for me. That trifle looks awesome. We will definitely be checking it out soon. Happy Easter, Laura! Glad your dinner went well! 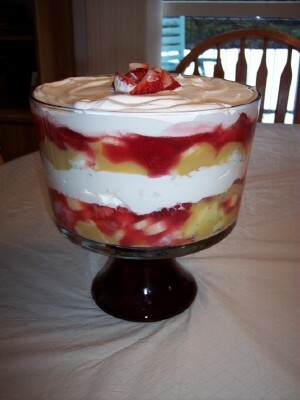 That trifle looks so gosh darn amazing- if I could eat sugar, I would be all over that thing! Don’t think I mentioned that I tried that dill pot roast that you posted a while back and really enjoyed it- thanks for the recipe! You have a yummy menu! Thanks for the links. That triffle looks delish! Your Easter dessert looks delicious! I am making my menu up completely of things I have in my house. I am not going to the grocery store for even ONE ingredient this week. Just milk. That picture makes me want to run right out and buy a trifle bowl today! Looks like a yummy week! Do you really set out your leftovers as a buffet? I take everything out of the ‘fridge and set it on the island and tell everyone that it’s “the week in review”. I so desperately need to re-re-reorganize my walk in pantry…please post some ideas! Oops, I was so pooped last night that I forgot to post here that I did indeed pull off getting my MPM up! That Strawberry Banana Triffle looks divine, might have to make that sometime soon! The grilled cheese is planned for tonight…I’ll let you know!! We’ll have to try the grilled cheese for lunch this weekend. I think we have all the ingredients on hand. Thanks for all your work in hosting this! Your menu looks great! Have a blessed week! Thanks for hosting. I’m trying to make a habit of planning a weekly menu. This helps. Thanks for hosting! I didn’t want to plan this week but after two days of no plan I could tell my family was “lost”. So I planned! The dessert looks great. I bookmarked it. We had your herbed tuna sandwiches and they were wonderful I might add. I’m glad you had a good Easter. Do you still have snow? When you get a chance, hop over & see the attic cleaning I’ve done. And I’ll welcome any advice to deal with the old paperwork up there! Hi! Well I finally tried the Deluxe Grilled Cheese sandwiches………to my shock and horror – my kids did not like it. What the potato is up with that? I, for one, LOVED it, and it occured to me…it is really just a cheese ball on a sandwich!! What’s there not to love. And I am so going to use leftover cheese ball this way. In fact, next time I’m going to add ham or tuna, some wort sauce, some green relish and Hello Yummy!! Oh….and I’m going to eat it all by myself! Love ya! K.
MMM…. I have made that beautiful dessert before, but I totally forgot about that recipe. Thanks for the reminder! I’m going to make it very soon! We made the trifle tonight. Amazing! We put it in wine glasses so that it we could serve it individually. I would recommend doubling the pudding and the bananas.